Camross dominated the Laois Camogie scene in the early 1980s. The above is the five-in-a-row winning side from 1985. Front Row (L. to R.) Miriam Breen, Rita Keenan, Mary Theresa Dowling, Ann Walsh, Catherine Scully, Margaret Dowling, Margaret McCormack, Mary Ann Lalor, Mary Scully. Front Row (L. to R.) Peggy Carroll, Breda Doran, Martina Dunne, Mary Sheeran, Alice Dowling, Sheila Delaney, Mary Scully, Mairead Bergin. Thanks to Breda Doran for her help with this photograph. The first Camogie club in Camross was established in the early 1940s. The very idea of a hurling club for ladies was anathema to the some of the local ‘gentlemen’ of the farming class, and to the clergy too. But these were stubborn women who fought for their place on the hurling field and kept the club going amidst the upturned noses of those involved in the ‘real’ hurling club. Mary Carroll, in Bygone Days in Camross, names these camogie pioneers as Brid Dunne, Molly Fitzpatrick, Molly Bergin, Chris Bergin, Lizzie Brophy, Mary Scully, Sheila Cuddy, Lilly Cordial, Lil Wall, Maureen Hogan, Patty Bennett and Sadie Bennett. The support of Sam Pratt, who would transport the ladies free of charge in hail, rain or snow to their games was vital in the continuance of the club throughout the 1940s and 1950s. The Camogie players of Camross were put into a development area for the game along with Kyle, Borris-in-Ossory, Rathdowney and Mountrath in 1949. The club was reformed by Fr. Lar Dunphy and Camross’ first competitive final of the modern era came in 1969 when they lost the Laois Camogie final to Durrow. The captain of the team was Sheila Keenan and Maureen Cuddy was the vice-captain. Despite almost claiming their first county title, there was little momentum for the Camross girls in the early 1970s. For instance, even though they reached another county final in 1970, they suffered a devastating 7-0 to 0-2 defeat at the hands of Ratheniska the following year. But improvement began to show once more toward the end of the decade. 1977 saw them reach another final only to face an opponent, whose very inclusion in the Laois Championship could be seen as grossly unfair; St. Fintan’s, Tullamore. The county town of Offaly had an easy victory over their rural Laois counterparts. A decade of hard work had passed by and the ladies still had not registered a Laois county title but they remained as determined as ever. They once again reached the final in 1979 where they took on Ballyroan. Ballyroan were a relatively new club, from a traditional football area, and Camross rightly fancied their chances against their more inexperienced opponents. 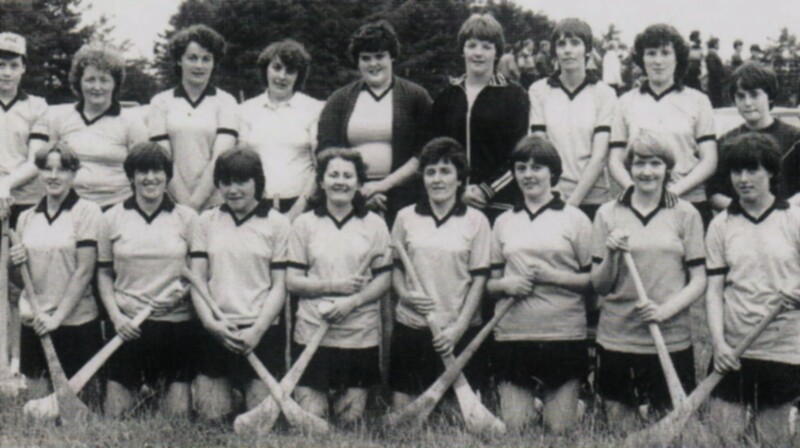 Camross’ finest players at the time were Moyra Carroll, Peggy Carroll, Diana Carroll, Mairead Bergin, Mary Sheeran, Angela Delaney and the Cuddy sisters. Unfortunately for Camross however, Ballyroan did have the assistance of several fine players from a defunct Ratheniska side who had won camogie honours in previous years at Camross’ expense. They were key to Ballyroan’s convincing victory on the day as Camross’ wait for a first camogie title went on. Mairead Bergin did give Camross an early lead but after this the Ballyroan defence were resolute and another Bergin score, a goal, was the remainder of the scores that Camross could muster for the rest of the game. Breda Cuddy and Peggy Cuddy led a fine effort in the Camross defence but following a disallowed goal for Camross, Ballyroan began to completely dominate and they ran out 19 point winners. The wait for a first county title would go on until 1981. Ballyroan were once again the opponents in the final in a rain swept O’Moore Park. Ballyroan were the clear favourites, despite their many close tussles with Camross over the years. Indeed the favourites led by a point at half time but, moments into the second half, Mary Scully scored her first goal of the game and the Camross girls did not look back. Scully went on to score another 1-2 whilst Alice Dowling scored a third goal as Camross eventually overran their opponents to secure a first county title. Mary Scully would go on to win the 1981 Camogie player of the year to cap a great year for the team which also seen them claim Leinster Junior honours. Their opponents in the Leinster final was Carlow champions, Myshall. The grit and determination of the Camross girls was exemplified by the manner in which they fought their way back from near certain defeat. With barely eight minutes remaining Myshall were six points up and were cruising. But Camross, led by Mary Scully, roared back into the game and managed to pip their opponents at the end with a one point victory. The Camross team on the day were Margaret Dowling, Anne Walsh, Rita Keenan (Captain), Peggy Carroll, Breda Cuddy, Mary Anne Lalor, Mary Sheeran, Martina Dunne, Sheila Delaney, Mary Scully, Alice Cuddy, and Agnes Delaney. Dinah Carroll was sprung from the bench in the second half. 1982 was another successful year for the Camross ladies as they retained their title with a 3-5 to 0-3 victory over neighbours Slieve Bloom. Slieve Bloom took the lead in the final through a Ber Fitzpatrick point but an equaliser from Mary Sheeran was added to by points from Mary Scully and Margaret McCormack. Mary Scully put in another great performance and scored her first goal just before half time and added a second in the closing stages. Camross closed out their opponents in the second half in a dominant performance led by their star performer Peggy Carroll. The Camross team on the day was Margaret Dowling, Rita Keenan, Anne Walsh (Captain), Peggy Carroll, Breda Cuddy, Mary Sheeran, Sheila Delaney, Martina Dunne, Mary Ann Lalor, Alice Cuddy, Margaret McCormack and Mary Scully. Dinah Carroll, Stella Ring, Miriam Breen, Catherine Scully and Mary Dowling all contributed from the bench. The Slieve Bloom team on the other hand were only in their second year and under the guidance of Martin Moore they knew that better days would come for them. Peggy Carroll was given the honour that year of being picked to represent her club and indeed her county when she was selected to participate in the prestigious Gradam Tailte Camogie skills competition in 1983. The competition was eventually won by 4 time All-Ireland winner, Claire Cronin from St. Finbarr’s in Cork. 1983 proved to be another successful year for the Camross ladies as they retained their county championship in a thrilling final against Durrow. In a game where Mary Scully scored 3-2 of Camross’ total it was Margaret McCormack’s contribution late in the game that proved the difference between the sides. With just seven minutes remaining in the game, McCormack scored Camross’ fourth goal and followed it up with her side’s sixth point of the afternoon. But two Claire Farrell goals for Durrow set up a tense finish. The Camross full back line of Ann Walsh, Paula Cuddy and Peggy Carroll along with Rita Keenan and Martina Dunne held out the Durrow attack as McCormack scored an insurance score for Camross as they were crowned champions on a score line of 4-7 to 4-5. 1984 seen an unprecedented four-in-a-row as Camross once again claimed the camogie crown. The opening half in the final against Slieve Bloom was a tight affair with both teams showing signs of nervousness. Slieve Bloom’s Ber Fitzpatrick exchanged points with Mary Sheeran and Margaret McCormack before McCormack scored an all important goal for Camross in the fifteenth minute. Further points from Martina Dunne and Kathleen Costigan completed the first half scoring as they held a five point lead at the break. The early stages of the second half was where the game was won and lost. Slieve Bloom mounted attack after attack but the Camross defence, led by Margaret Dowling in goals, who pulled off two great saves, and Peggy Carroll, were resolute as Camross’ superiority increased. In the end Camross were comfortable enough as they won by eight points. Mary Ann Lalor was presented with the cup by camogie chairperson Geraldine Cuddy. Camross’ dominance in the Laois camogie scene continued unabated in 1985 when they became the first team to be presented with the new Laois trophy, the Billy Phelan Cup, after they defeated Ratheniska in the final. Sheila Delaney accepted the cup on behalf of the victorious Camross team which was trained by Joe Doran. Camross’ emphatic dominance of the Camogie scene came to an end in 1986 when they were defeated in the county final by Slieve Bloom. Further disappointment followed for the girls as they were once again defeated in the 1987 final by Slieve Bloom on a score line of 2-10 to 3-5. The see-saw nature of the Camross-Slieve Bloom rivalry swung in Camross’ favour once more in 1988 as they regained the Billy Phelan cup. Camross reached the final in 1989 and sought to close out the 1980s with victory. But their old rivals Slieve Bloom once again denied them the title on a score line of 7-6 to 3-11. Slieve Bloom completed their three-in-a-row two years later with a 4-12 to 2-6 win over Camross in the 1991 final. Indeed, it was not until 1992 that Camross put something of a dent on Slieve Bloom’s dominance. A second half goal from Sinead Cuddy was the vital score as Camross drew with their arch rivals on a score line of 1-3 to 0-6 to bring the final to a replay. Sadly, however, it was to be but a brief reprieve, as Slieve Bloom won the replay by a narrow margin to claim four-in-a-row. Slieve Bloom’s Leinster Championship campaign was an eventful one and it led to incidents which brought the very game into danger in Laois. Slieve Bloom took on Avoca in the 2nd round of the Championship and the game was marred by controversy with several incidents of rough play, and outright assault. As a result of a suspension that Slieve Bloom received, they took the drastic decision to disband for the 1993 season. This temporarily crippled the game in the county and Camross were automatically deemed to be champions for the season. It was hardly the way Camross wished to return to the top of the camogie scene in Laois. But the following year Slieve Bloom were back and the 1994 final was an opportunity for Camross to prove their worth on the field of play and win the title that they had won the previous year off the field. The game ended in a draw. Camross looked as if they were going to win the title following points from Trish Cuddy, Sharon Palmer and Yvonne Keenan which gave them a two point lead. But Ber Fitzpatrick had other ideas and she scored two late points to level the game and force a replay. The replay was one of the finest games of Camogie played in Laois for years. Both teams were evenly matched in the early stages and all of Camross’ early points were matched by the accuracy of Ber Fitzpatrick. The crucial score of the first half was a Camross goal. Paula Cuddy set up Sharon Cuddy who finished the ball to the Slieve Bloom net to give Camross the lead. Yvonne Keenan scored an excellent point just before the break as Camross went in 1-6 to 0-3 ahead. The second half was barely five minutes old before Camross had been pegged back. Catriona Coss and Anne Marie Fitzpatrick cut their way through the Camross defence to score two goals that brought Slieve Bloom back into the game. But credit to Camross, and Paula Cuddy in particular, the black and amber held on. Cuddy gave Camross the lead once more when she soloed the ball herself through the Slieve Bloom defence to score Camross’ second goal of the game. Four points up, Camross would not surrender their lead a second time. Try as they did Slieve Bloom were unable to break down the Camross defence and when Sharon Palmer scored her second goal of the game the game was beyond Slieve Bloom. Camross were champions following a great game on a score line of 3-10 to 2-7. The chair of Laois Camogie, Theresa Keenan, presented the trophy to Sinead Cuddy amidst great celebrations. It was the culmination of an immensely successful season for the Camross ladies who also won championships at Minor, U-16 and U-14 levels. The Camross girls retained the title in 1995 against new opponents, Portlaoise. The hurlers of both clubs had clashed in dozens of infamous ties over the previous 15 years, but it was the Portlaoise camogie team’s first appearance in the final. Their lack of experience at this stage told very early on, however, as Camross dominated in the first half and built up an unassailable lead by half time. They went on to record an 8-5 to 1-2 victory. They continued their fine season by qualifying for the Leinster Junior Camogie final where they were beaten by a point by Carlow club Myshall. At underage level, the great achievement of success at Minor, U-16 and U-14 level was repeated. Camross camogie club had come a long way from being derided by their fellow parishioners and transported around the county in less than ideal conditions by Sam Pratt to emulating their male counterparts in achieving a five-in-a-row in the 1980s. Success became ingrained in the ladies of the parish when they took to the field and this success continued on into the late 1990s and the 2000s. Indeed, when the hurling team was faltering it was the ladies who kept the flag defiantly flying with an unprecedented 11 years atop of Laois Camogie. Mary Carroll, ‘Camogie in the 1940s’ in Bygone Days in Camross (Portlaoise, 2000), pp. 84-85. Leinster Express, 23 Apr. 1949. Leinster Express, 31 Jan. 1970. Leinster Express, 19 June 1971. Leinster Express, 26 Nov. 1977. Leinster Express, 20 Oct. 1979. Leinster Express, 10 Nov. 1979. Leinster Express, 25 July 1981. Irish Press, 25 Feb. 1982. Leinster Express, 3 July 1982. Irish Independent, 3 June 1983. Leinster Express, 9 July 1983. Leinster Express, 14 July, 1984. Leinster Express, 20 July, 1985. Leinster Express, 11 July 1987. Leinster Express, 15 July 1989. Leinster Express, 10 Aug. 1991. Leinster Express, 18 July 1992. Leinster Express, 23 July 1994. Leinster Express, 6 Aug. 1994. Leinster Express, 8 Aug. 1995.